RT:Several senior American officials say Russia is the greatest threat to US national security. Why is such rhetoric being employed by senior American officials? 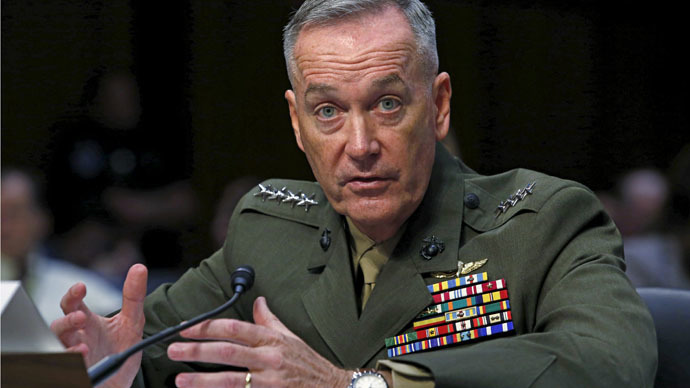 Brian Becker: We have to understand this rhetoric and these presentations first by the Air Force Secretary Deborah James and Major General Joseph Dunford, soon to be Chairman of the Joint Chiefs of Staff, both of whom pose the presentation that Russia is an existential threat and the greatest threat to America. They also say, and this is very interesting, that it requires the 28 NATO members to step up and do their part to spend at least two per cent of their GDP on military spending in NATO, and only four of the 28 members of NATO are doing it so far. What the US military officials are basically telling NATO is: “Get in line, this is an existential threat, you have to spend more of your money, money that is being drained from other parts of the economies of Europe." A lot of that money will go to US war contractors. So the ABCs of the war propaganda Russia is an existential threat is that it is very good, very necessary in fact for the biggest war contractors, the biggest parts of the military industrial complex in America. That is one part of the story. RT:What is calling Russia 'the biggest threat'' and lumping it in with Islamic State going to lead to? BB: It doesn’t just lump Russia in with ISIS, it says “Russia is a greater threat to the US and to the West, and to world peace than ISIS.” Now you see the US’s government right now is at war, endless war with IS because purportedly it poses an existential threat. But if the existential threat posed by Russia is even greater than IS, you can make the case, and I think it’s absolutely true, that the US military is preparing the American public for military confrontation, conflict of some type with Russia, which would seem to all people to be absolute madness. Nonetheless, they must be doing this to prepare the population to allow greater and greater military threats to go against Russia. Now, once the Pentagon claims the escalation ladder, carries out massive war exercises on Russia’s border, Russia will be compelled to meet that threat. That’s how conflicts go from small conflicts to bigger conflicts, and even possible global conflicts. RT:European officials have been so far reluctant to boost military spending for NATO. Do they not fear any imminent threats that the US is citing? BB: The European powers know absolutely that this is hogwash. They know with certainty that the US is beating the drums of war in order to get them to spend more of their money on military equipment, much of which will be purchase from the US. And they also know that it’s easy for American politicians, and the Generals in America are just politicians in uniform before they become big businessman when they circulate back into corporate America, they know that they are playing with fire. It is very easy for American officials to talk tough against Russia. But Europe knows all too well, the dangers of real war, the danger of WWI and WWII which is 70 years over this year. They don’t take lightly to the fact that the Pentagon is playing with fire. And of course it will be the European people who will be on the frontlines, not Americans. RT:US military officials said that they knew Europe was facing tough economic challenges, but NATO commitments should still be a priority. Is this talk of threats a way to secure NATO funding? BB: Yes, that was my point. I think a lot of this is to keep the alliance together. They know that Germany and France, and other major European powers could start to have very warm and good relations - economic, political, and even possibly military relations with Russia. They are trying to keep the discipline of the alliance, and they are also trying to make sure that those countries pay their fair share to the war effort, to the NATO war effort, which, as I said, benefits US war corporations. RT:European officials have been so far reluctant to boost military spending on NATO. Why do you think that is? Paul Heroux: There could be a number of reasons. The crisis in Greece right now is putting pressure on other European counties because there is maybe a need for a debt bailout. But at the same time we don’t want to go back to the old ways of huge deficit spending on the military. I would like to think we’ve progressed a lot more and we’re going to do more diplomatic solutions. RT:You talk about diplomatic solutions... Is it diplomatic to call Russia 'the biggest threat' to American security? PH: No, I don’t think it is. But I also think that was made by somebody whose job is not to be a diplomat, somebody who is either a general or secretary of one of the branches of our [US] armed forces. Their job is to bring to attention what, in their point of view, is going to be a big threat. We also have other people in the US saying that the biggest threat to US security is cyber terrorism, or cyber security; other people say it might be global warming; other folks might say it’s ISIS or terrorism, and some might even say the nuclear program in Iran. RT:Does calling Russia "the biggest threat" suggest the deterioration in relations between Moscow and Washington? Is that the sign there is no real hope for dissent dialogue in the next coming weeks and months? PH: Deterioration has been going on for a number of years, that’s right. From the point of view of the US, Russia is the problem, from the point of view of Russia; it’s probably the US that’s the problem. The important thing is that they keep working together. What we need to do is basically take baby steps, small, realistic goals that can be achieved rather than trying to change the whole landscape of the negotiations and the state of affairs between the two countries. Small realistic baby steps will help develop a sense of trust and a sense of shared interest. And I think that’s the direction we should be going in. RT:Why has the trust deteriorated so badly, do you think on the both sides since the so-called reset? PH: I think it could be a number of issues. Just the interest of the US and Russia. Russia, for example, is trying to reclaim its former kind of Eastern superiority, and that may sometimes complete with some US interests or some of NATO’s interests. Other times the US is also trying to keep ourselves from sliding into place where other countries don’t want to work with us, and it’s a difficult balance. Also it largely could be just the personalities of different leaders. We see that with Barack Obama and Benjamin Netanyahu; we saw that starting with Vladimir Putin and George Bush. So personalities do play a large role in these negotiations and discussions.